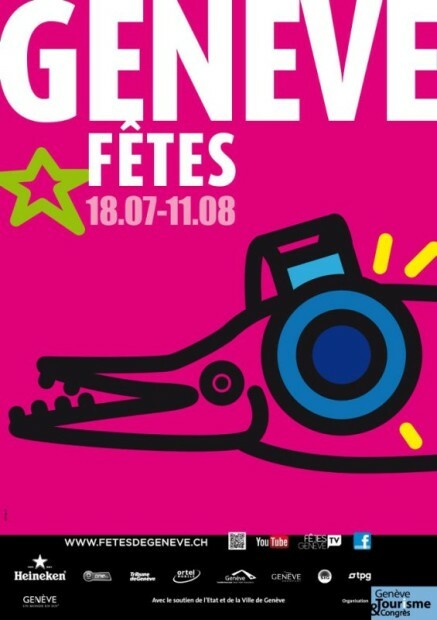 Now that summer is in full swing, the time has come to celebrate Geneva’s Summer Festival, known as Les Fêtes de Genève. 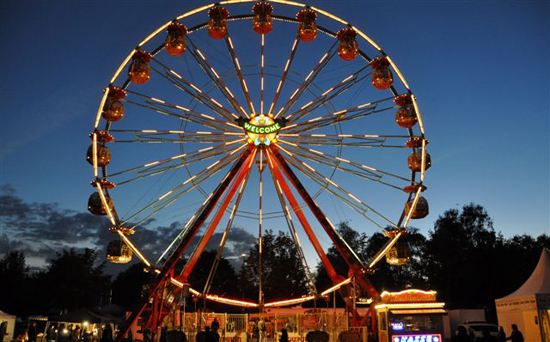 From the 18th of July to the 11th of August 2013 the city of Calvin will let its hair down and dazzle visitors with a plethora of fantastic events, many of which will be free of charge. The first time we visited the Fêtes de Genève my baby girl was just a few weeks old and I remember how much we enjoyed walking down the Quai Wilson with her in the baby-carrier and the boys, who were super excited about all the attractions and food stalls – it was definitely a great way to soothe a colicky baby on a summer’s evening whilst enjoying some special family time. 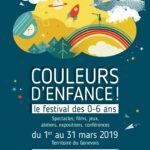 Whether you’re a funk or hip-hop fanatic, a sporty daredevil or a family with young children, rest assured that you’ll find plenty of fantastic entertainment at the Fêtes de Genève. Here’s a quick run-through of the festival’s impressive line-up but remember to check the official website for full details. 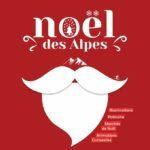 The choice of free, live concerts will be staggering, with an incredible 150 free concerts taking place on three different stages: the famous Club Stage in the heart of the Jardin Anglais; the very popular Funkytown Stage at Baby-Plage and the new Wilson Stage on the Right Bank. Every musical genre will be represented and many international stars will make in appearance in order to satisfy even the most eclectic crowds. Whether you love Jimmy Sommerville, Julian Marley or Bollywood dancing you won’t be disappointed. 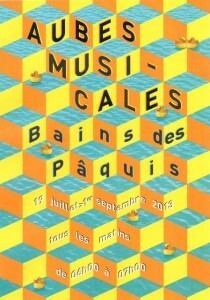 If you or your children are very early risers, don’t miss the Aubes Musicales every morning until the 1st of September 2013 at the Bains des Pâquis. Start the day with a mellow live concert from 6am to 7am and don’t forget to grab a free cup of coffee ! 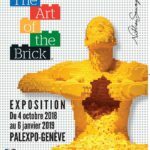 National bands from Scotland, Belgium and France will also be performing as part of the Street Artists section. The Festival opening fireworks will take place on Saturday 3rd of August 2013 and the theme will focus on Portugal, this year’s guest of honour. The show will last approx. 20 minutes and will be free of charge: no need to buy tickets for the opening night fireworks. For the original showstopper though, you will have to wait until Saturday 10th of August 2013, when the grand firework display will be taking place. Starting at 10pm on the quays around Geneva harbour, the show will last around 55 minutes: the start will be a journey through traditional and contemporary Portuguese music. The second part of the show will focus on the theme “Conquests and Conquerors’’, presenting a voyage that will take you from Alexander the Great to New Zealand, via The Vikings, Genghis Khan, Marco Polo, Christopher Columbus and the great Portuguese conquistador Magellan. Finally, the eagerly awaited culmination of the display will depict the conquest of space, from the first dirigibles to man’s unforgettable first steps on the moon. Seats for the Grand Firework Display cost between 50CHF and 70CHF but you can watch the show for free as well, although it gets very crowded and it might be tricky to find the best vantage point for the children. For an authentic taste of the Far West, head no further than the Place du Rhône from the 1st to the 11th of August 2013. From free rock & blues concerts to country dance classes, it will be like stepping into a Western movie: kids will love meeting the cowboys and dads will probably be eager to see the Coyote Girls show ! If you’re feeling lucky, try your hand at grabbing as many banknotes as you can with the “Money Cash Machine”. The “Once upon a time in the West” area will open at midday and will offer many scrumptious food stalls serving brochettes, kebabs and sushi, as well as Brazilian delicacies. This extreme sports festival is an absolute treat for all watersports fanatics: on Saturday 3rd of August 2013 from midday to 8pm watch the acrobats of the XTREME de la Rade perform their spectacular waterski jumps, or cheer on the rowing sprint cup, dragon boat or jetski freestyle. During the Lakefront Festival, the flow of water in the lake is reduced (in cooperation with SIG) to make the surface of the water as smooth and flat as possible. The Bouveret dam at the other end of the lake is closed in order to prevent swirls that might prove dangerous for the acrobats. 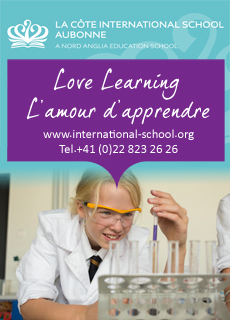 See the official website for full details & don’t forget your camera ! 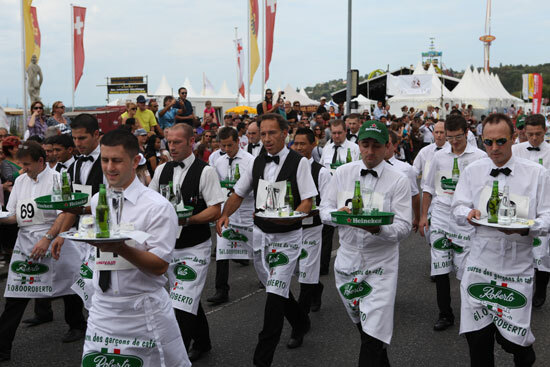 A very traditional part of the Fêtes de Genève celebrations is the “Waiters & waitresses race”, which will take place on Sunday 11th of August at 3.30pm. One hundred professionals nominated by their employers will be covering 1.8 kilometres while carrying a tray with two glasses of water and two full bottles in one hand. The goal is to go from Baby-Plage towards quai Gustave-Ador, crossing the city as fast as possible without spilling a single drop of water ! It is truly exhilarating to watch these seasoned professionals run a race against the clock, as the enthusiastic crowd cheers them on. These are just some of the highlights of this year’s Fêtes de Genève, but there’s a lot more fun to be had with the kids at the funfair – stretching between the Quai Gustave-Ador to the Quai Wilson and across the Jardin Anglais – from the 1st to the 11th of August 2013 with its 70 thrilling attractions for all ages and giant Ferris Wheel. 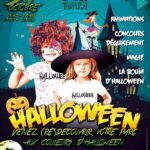 Last but by no means least, Yatouland will also be on call at the heart of the Jardin Anglais to provide a wide range of activities, bouncy castles and games for children aged 0 to 10. Open from the 1st to the 11th of August 2013 from 2pm to 8pm (except on Thursday 1 August, open from 5pm and from 10am on Sunday 4th of August. On the night of the fireworks, Yatouland will close at 6 pm). Price: CHF 5 for children (2 hours). Free entry for adults and guardians. Les Fêtes de Genève are about to begin, hope you will enjoy them as much as we did ! 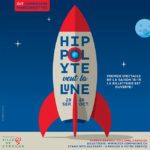 Cover photo & selected text descriptions © 2013 Fêtes de Genève.